Our Soccer Puzzle With Logo from the desk top items department here at Calendar Lady Promotions is a high quality steel metal desk top jigsaw puzzle in a football style design. This excellent desk top item can be used as a paper weight or simply enjoyed as a puzzle. So help to promote your business details and company logo by having them laser engraved onto our Soccer Puzzle With Logo today! To find out more about our Soccer Puzzle With Logo click here and fill in the contact form and we'll get straight back to you. 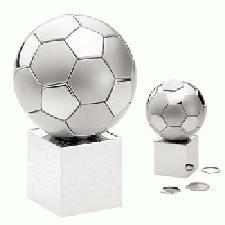 Other promotional and personalised items besides our Soccer Puzzle With Logo click here.